"Forget about the blue box (you know what I'm talking about) and make homemade mac and cheese for a weeknight dinner. 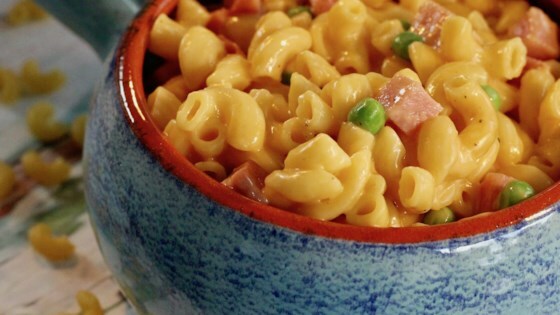 The ham, peas, and optional hot sauce add some pizzazz to classic mac and cheese. Adjust the consistency of the mac and cheese sauce to suit your personal preference. I used Kraft® 2% Milk Extra Sharp Cheddar Cheese to reduce fat with no negative effect on taste." Combine water, elbow macaroni, mustard powder, salt, and hot sauce in an electric pressure cooker (such as Instant Pot(R)). Close and lock the lid. Set to high pressure according to manufacturer's instructions and cook for 4 minutes. Allow up to 10 minutes for pressure to build. Release pressure carefully using the quick-release method according to manufacturer's instructions, about 5 minutes. Unlock and remove lid. Switch to Low Saute function by pressing Saute once and Adjust twice. Stir macaroni to separate any clumps. Stir evaporated milk, milk, and butter into the pot. Add Cheddar cheese and Monterey Jack cheese gradually, stirring constantly until melted. Stir in ham and peas. Season with salt and pepper. My daughter loved it. I thought it was ok. I think I need to cook the noodles less. They got a little mushy/clumpy. Made this again and used Turkey Kielbasa instead of ham. I love the recipe. It is so easy and creamy. The kielbasa just made it even more delicious, but I love kielbasa so I am partial. This was a very easy, gooey, cheesy dish to make. It was very delicious. My son loved it so much that the leftovers were gone before I got a chance to reheat it!